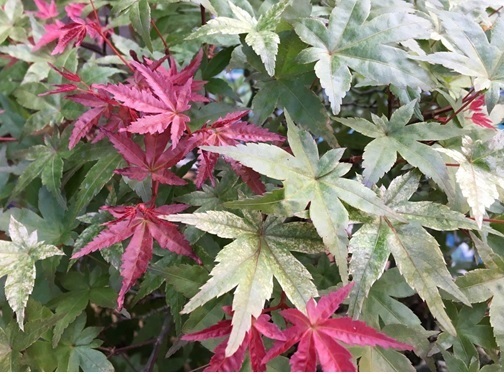 Last month I took advantage of the fact that there is a small window to prune Japanese Maples, just as their leaves are dropping, so that they won’t bleed. I pruned a few of the bonsai on my benches, but my main targets were the trees in my landscape. When moved to a new house, we inherited a ginormous weeping Japanese maple, front and center in the most prominent area of our yard. It’s probably 15-20 feet across. I was able to cut it back a bit last year, mostly to keep it off the driveway. But this was the year that I wanted to get in and do some real structural work. Along the way, I pruned another large maple in the yard, as well as my mother in law’s maple, and another friend’s large specimen. For some reason, after twenty years of pruning this type of tree, things really started to sink in, so I thought I would share some new and confirmed insights. I can now prune with confidence at a fairly feverish pace and the decisions fall easily right into place. First of all, the most important aspect here is the non-bleeding time of year. I find that a good time is when there are just a few fresh leaves on the tree, but it’s lost all the others. Take a snip and wait just a few seconds. If it bleeds, wait another week. As the leaves start to abscise from the tree, the sap is also slowing down to a halt. Otherwise it would be pushing sap out of the points that just lost leaves. The tree then begins to heal over and seal up these areas and the sap re-pressurizes a few weeks later. So, if you prune in December, you get bleeding all over again. It can extremely weaken the tree if you let it bleed profusely. In the spring, it provides entrance for fungi. You can prune safely after the leaves have hardened in the spring, around April or May, but it is very hard to see the overall structure. 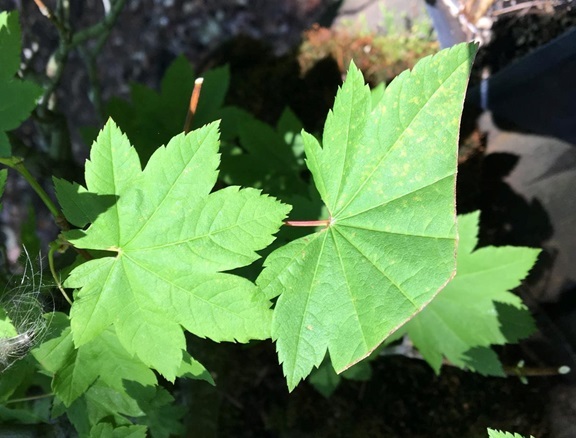 Next, and just as important, is the fact that although maples have an opposing leaf structure, those opposing pairs rotate 90 degrees every other pair, making horizontal or vertical oriented buds. I have not really paid all that much attention to this feature in the past, but things really started to click when I did. I now understood why some branches seemed to just reach for the sky and others spread out. It was just they way they started on the main branch. Look at the photos. You can see in the first one the orientation of the buds, how they alternate along the branch. 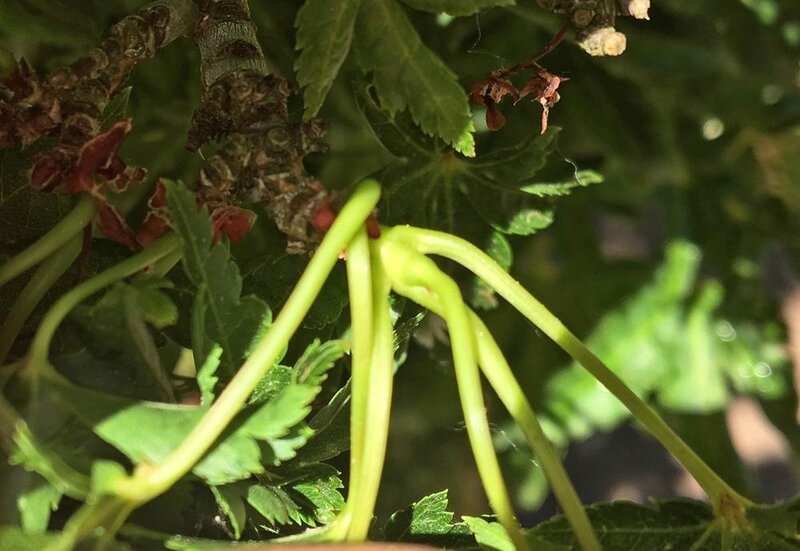 In photo two you see an unpruned branch and how the structure is developing into vertical branches and horizontal branches. I no longer prune back to the first node on a branch, but to the one that is oriented in the direction I want. In bonsai, I always prune to the horizontal branches, unless I have a need to create depth. On these weeping landscape trees, I am going for something a little different. Here is the interesting part. Remember those vertically aligned shoots? As I went to prune this year, I noticed that 95% of the dead branches were those that were the bottom half of a pair, the ones facing down. It didn’t matter if the branch was one year or five years old, those were the ones that were getting weak and dying on their own. The tree was educating me and telling me how it likes to grow. It was doing it’s own pruning. Look at photo two and you will see that the downward facing buds have disappeared on their own. So taking that cue, I began cleaning out those downward branches anywhere I could. It’s a quick way to shorten branches or thin things out. After several seasons and/or several cuts you begin to develop an undulating structure that creates great movement and allows you make foliage pads on a weeping tree. Look at photo three and you can see the effect of this style of pruning. 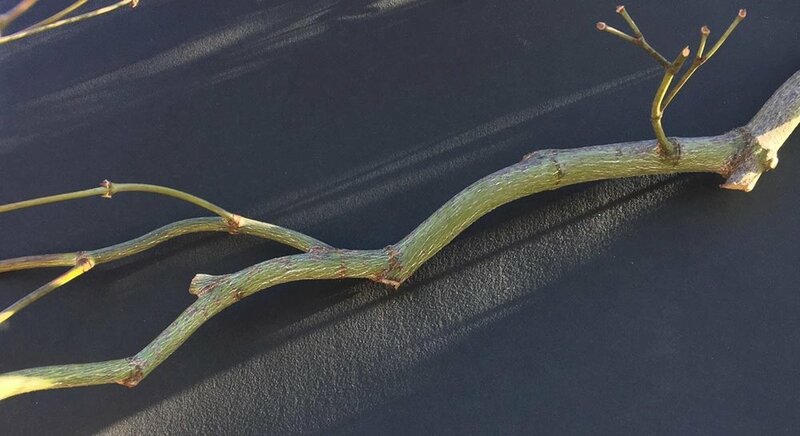 I have been pruning like this for awhile, but now I finally understand that alternating nature, how to use it effectively, and what to expect next year. So my suggestion is to grab your saw and pruners and dive into one of these trees and see what you can learn. There are so many more branches to work with than on bonsai, so much more practice. And if you make a mistake, it’s easy to grow more branches. It’s not so critical as your prized bonsai and you can relax a bit. Take that snip and see if you are still in the window for pruning.